Will Your Business Give You a Big Gift? If you own a business today, you could be sitting on a gold mine… but without knowing these 3 secrets, you will easily squander your riches. Sure, you already enjoy a great lifestyle because of all you have done to build and grow your business. But I’m talking about an even larger return on your investment in your business, a game-changing, life altering, mind-blowing future you probably don’t think about very often. Unless you are technology entrepreneur. If you are, (cue hoodie, laptop and investor elevator pitch) then you think about how you will exit your business every morning. How come? Your angel investors are pestering you to tell them when they will get their return on investment in your business. Angel investors ask me (generally with a furrowed eyebrow and frustration in their voice) how to light a fire under the entrepreneurs they have invested in… and they make these comments within earshot of their investees. I peer around the shoulder and crossed arms of the Angel talking to me and see a squirming 20 something rolling their eyes. Now I see two squirming, eye-rolling people. He asks this while wrangling the entrepreneur to stand beside me and get into the conversation. The company has had consistent profits for at least two years. That feat proves theirs a happy, loyal, growing market loving the product or service. The company has captured a narrow yet growing market and is the go-to business. That signals good margins – it doesn’t compete on price. There is a management team that has proven it knows how to grow the company. That shows the owner has let go of the reins. Knowledge is embedded in systems and procedures, not locked away in the heads of a few key people. This makes the company transferrable meaning the next owner gets what they paid for. The owner does not have a functional role that the company depends on for rainmaking, product development or key relationships. This means the owner has learned to let go of control and can negotiate at arm’s length with a buyer. Now technology companies are being hunted by some deep pocketed giants ready to sink millions into un-proven technology pre-revenue, it’s true. So this list might not be appropriate for every tech entrepreneur. However, it is the right list for the rest of us business owners who didn’t jump on the tech bandwagon. Another key difference between tech and other industries? There are no shortage of mentors coaching, prodding and shepherding their investees into success and results. So they get these secrets bestowed on them regularly. Of course, the devil is in the execution. They hear that all the time too. Don’t own a tech business? Then read on. You need to know what you are missing out on. So who is the Angel Investor in your company? Who is standing behind you, tapping their foot and expecting a return on their investment, that big exit payday? That’s right… it’s you. Are you pestering yourself for a return on your investment an external investor would? Are you getting lots of mentoring and great advice so you can execute the right plan to get your desired return? Let me be your Angel wrangling you into this conversation. I’m going to let you in on the third big secret. 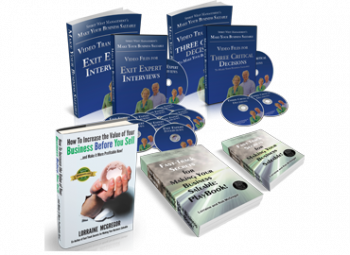 You may believe that only technology entrepreneurs are getting the exit big paydays and your company would never qualify. There is $10 Trillion dollars sitting on the sidelines looking to acquire companies outside of technology too. It’s been sitting around since 2008 waiting to find the right investments. What do these investors look for? Owners who have done the work of making their companies saleable. Oh, heads up… most companies are run for the benefit of the owner, which makes them un-saleable… and most owners are not aware this is a huge problem that stops 90% of owners from finding buyers. This doesn’t have to be your future. You’ve got an Angel on your shoulder! You can choose to make the changes inside your business that make it saleable. Learn how. 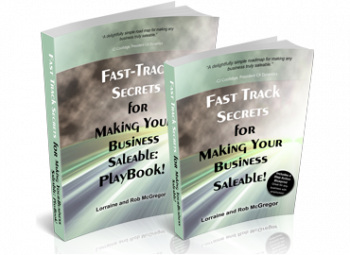 Read “Fast-Track Secrets for Making Your Business Saleable”. 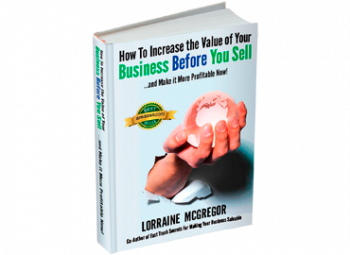 Buy the book and the playbook and you will have a blueprint to know what to change in your business so that in 2-4 years, your company is both saleable and more profitable. If I was the Angel Investor in your business, I’d want that outcome. PS…. One more secret that Angel investors also know that you might not: Buyers look for acquisitions when its right for their strategic mandate, not when owners have decided its time to sell. Make sure luck meets your preparation when your ideal buyer is looking. Start now.